West Virginia Code Section 36-3-5 establishes a statutory form for conveying real property in West Virginia. When a deed contains the words for release codified at Section 36-3-7, the deed is construed to convey whatever right, title, and interest the grantor has in the premises granted, "as if it set forth that the grantor or releasor hath remised, released, and forever quitted claim." Quitclaim deeds provide the least amount of protection for the grantee (buyer) because they contain no warranty of title. A quitclaim deed, therefore, is a common manner of conveyance for clearing title or when adding or removing parties from the deed. 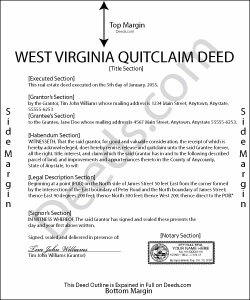 A quitclaim deed in this state is void as to creditors and subsequent purchasers for valuable consideration without notice until it is recorded in the county where the property is located (W. Va. Code 40-1-9). To record a quitclaim deed with a county clerk in West Virginia, the instrument must meet state and county requirements of form and content for documents pertaining to an interest in real property. All recorded deeds must be accompanied by a Sales Listing Form. Consult a lawyer with questions about quitclaim deeds or for any other issues related to transferring real property in West Virginia.